In Advent we are stirred to contemplate the mystery of the Incarnation in light of hope, peace, joy and love. This year, as we mark the centenary of the first world war, let us take hope by reflecting upon the elusive but inspiring peace experienced among many soldiers along the front lines on Christmas Day, 1914. 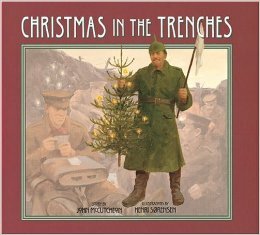 “My name is Francis Tollivar, in Liverpool I dwell…” So sings John McCutcheon in “Christmas in the Trenches,” his classic folk song about the Christmas truce of World War I . The song was released on McCutcheon’s Winter Solstice CD, one of our all-time top-ten Christmas albums featuring McCutcheon’s enduring songwriting and masterful hammered dulcimer arrangements. A few years ago, it inspired a storybook illustrated by Henri Sorensen. Remarkably, this high-production quality video was released as a Christmas ad. The blue-wrapped chocolate bar featured in the film is being offered for sale this season at Sainsbury’s stores in England, with 100% of proceeds going to the Royal British Legion, to benefit armed forces families, past and present. Far from trivializing the nature of war, the video expresses the longing for peace in every human heart, the validation of which we celebrate in Advent. If I lived in England, I would be buying a lot of these, but unfortunately they’re not available online, so I’ll follow their example and wrap my own chocolate bars. In this centenary year, a number of books have appeared which reflect on the significance of the war for shaping 20th century culture and intellectual life and, particularly, its implications for Christian belief. Profoundly impacted by the horror of the war, many writers (e.g., Karl Barth , Tolkien and Lewis ) grappled their way to an escape from despair, imaginatively creating a vision of hope and peace that nourishes readers for the rest of the century, and for generations to come. 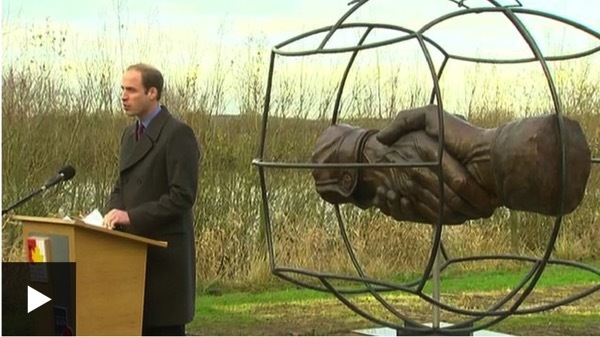 The story of the Christmas truce foreshadows the undaunted resiliency of Advent hope and peace, even after a century filled with wars and rumors of war. 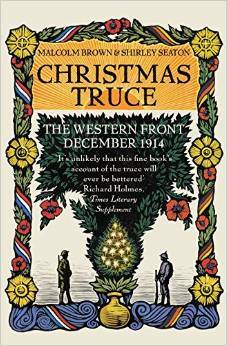 Malcolm Brown and Shirley Seaton, Christmas Truce: The Western Front December 1914 (London, Pan Books, 2001). 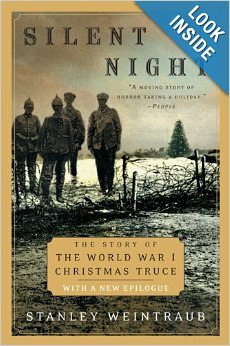 Stanley Weintraub, Silent Night: The Remarkable Christmas Truce of 1914 (London, Pocket Books, 2002). Joseph Tkach Peace , an Advent episode from his Speaking of Life podcast. My previous post on Earthrise. This entry was posted in Holidays and tagged Christmas. Bookmark the permalink.